C. F. Martin 0-15 Model Flat Top Acoustic Guitar (1955), made in Nazareth, PA, serial # 146967, natural lacquer finish, mahogany back and sides and top; mahogany neck with rosewood fingerboard, molded plastic hard shell case. 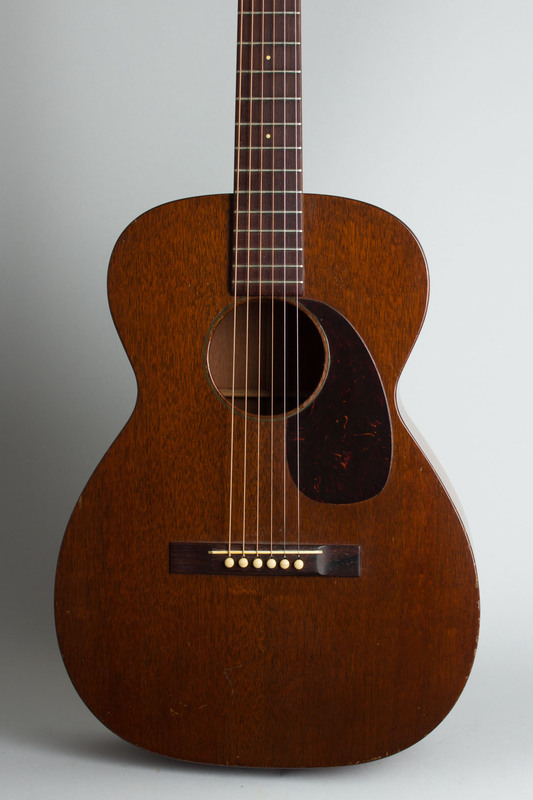 This is a nicely preserved, great playing and sounding mid-'50s 0-15, the lowest-ranked guitar model in Martin's line. The 0-15 is a study in careful economy; the finish was less polished out than the otherwise identical 0-17, but structurally the guitars were the same. The standard Martin appointments are reduced to the minimum. There is no ornament besides a W/B/W sound hole ring, tortoise celluloid pickguard, and gold Martin logo decal. 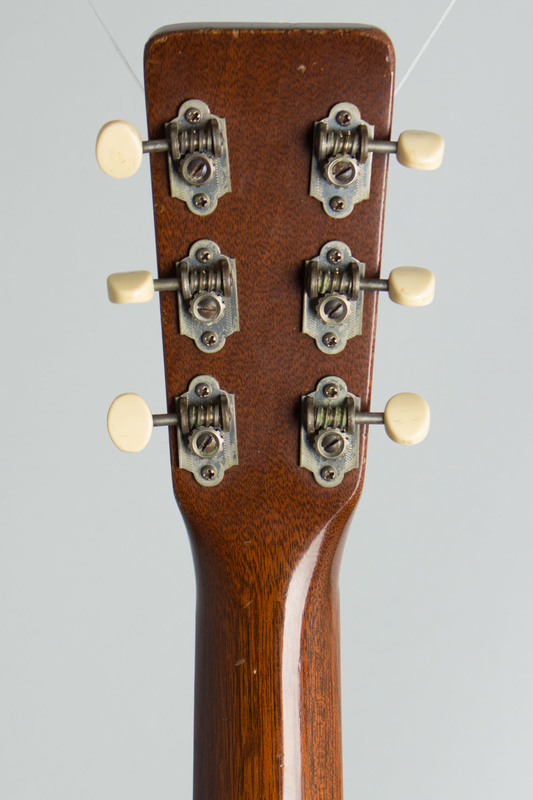 The tuners are large-plate openback plastic-button Waverlys typical of the '50s. 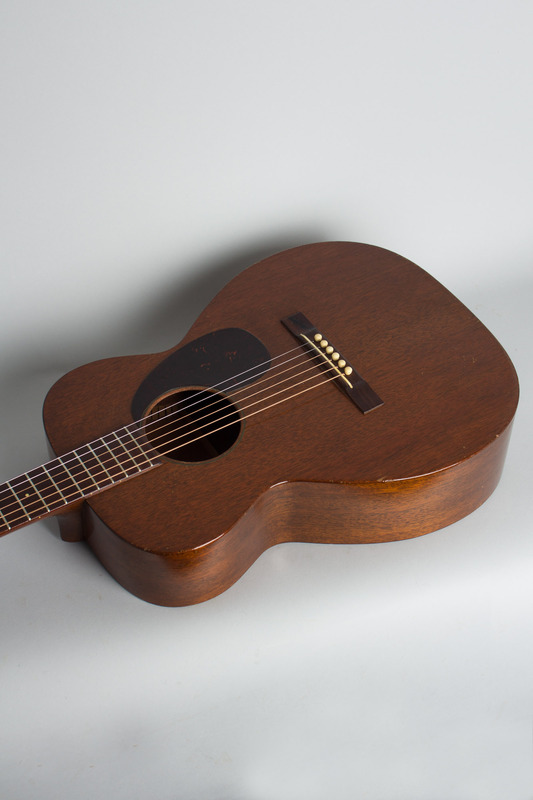 This small-bodied all-mahogany guitar has a surprisingly loud and rich voice, and sounds great finger or flat-picked. 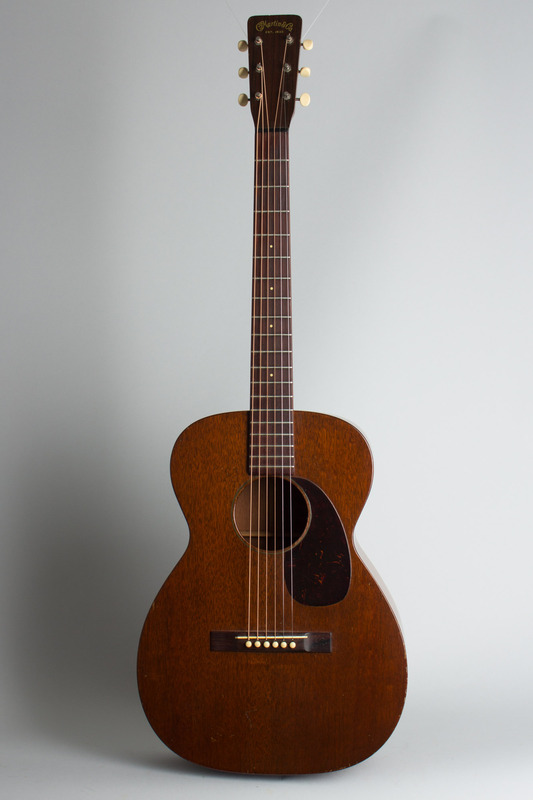 While this was the least expensive guitar Martin offered, listing for $70.00 in 1955, it is still built to the expected Martin standard of quality and is an extremely fine instrument. A total of 925 of these little mahogany marvels were shipped from Nazareth in 1955, the model's peak production year. This is a very nice example, complete in a fitted Martin blue molded plastic case likely sourced for it in the early '70s. Overall length is 38 1/2 in. (97.8 cm. ), 13 1/2 in. (34.3 cm.) wide at lower bout, and 4 1/8 in. (10.5 cm.) in depth at side, taken at the end block. Scale length is 24 3/4 in. (629 mm.). Width of nut is 1 11/16 in. (43 mm.). Overall this is a relatively clean guitar, nicely preserved for being almost 65 years old. 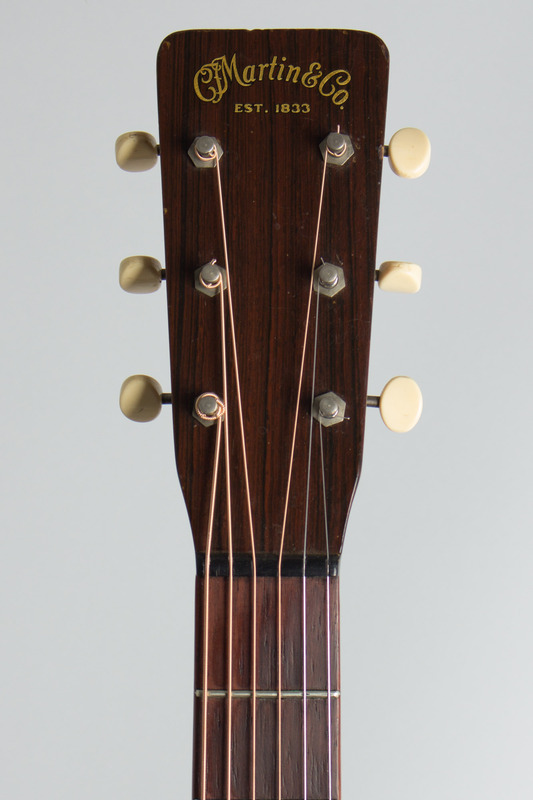 The finish shows dings, scrapes, and dents, especially along the edges, and the sound hole rim is worn away a bit on the treble side. 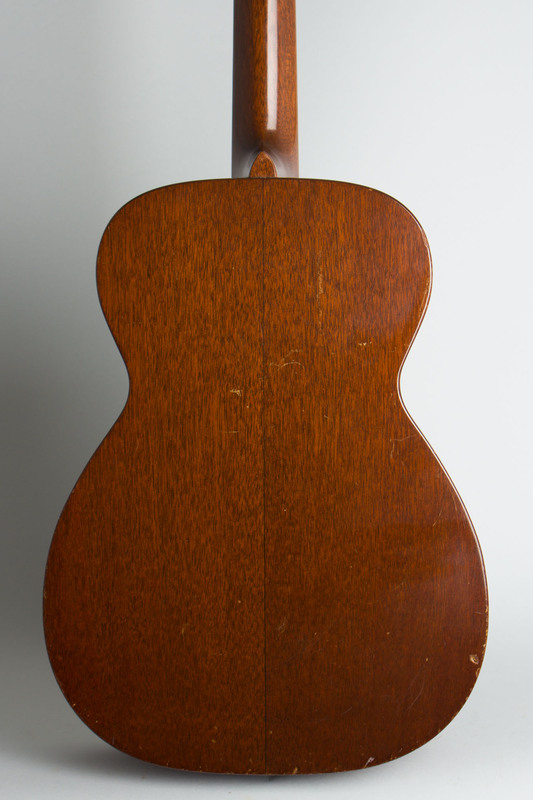 The guitar is completely original including an uncut rosewood bridge; it does appear to have had a neck reset some time in the past. 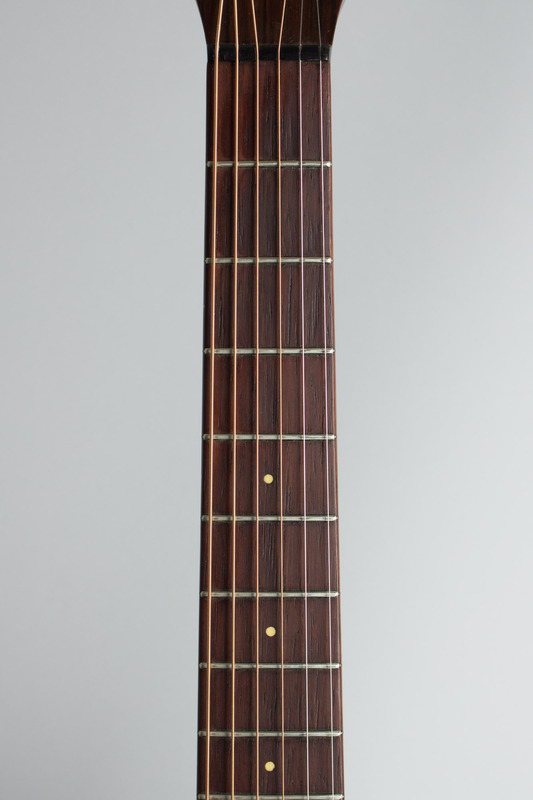 There is not much actual play wear; the original frets are intact with some light wear in the lower positions. A very nice example of this most humble of Martins, with a sweet but surprisingly loud sound. Excellent - Condition.